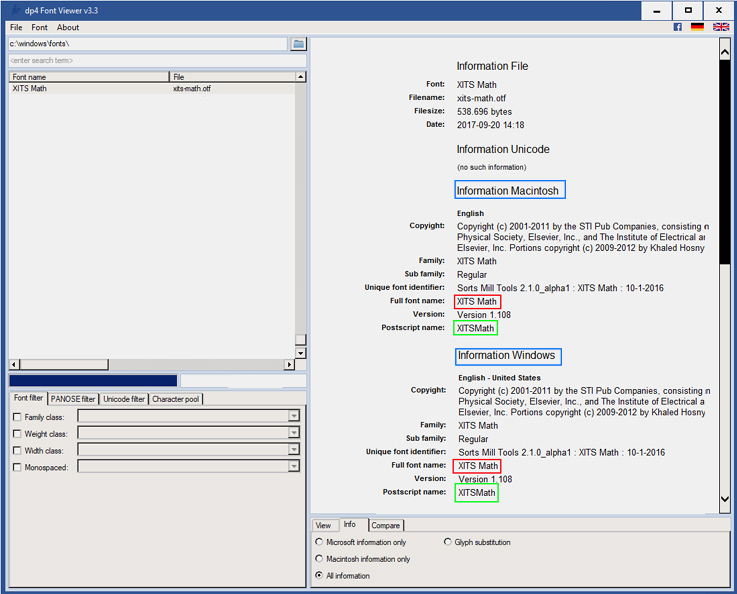 Jump directly to the "Ultimate Finale Font Name Troubleshooting Guide"
Jump directly to the "Rules for Font Developers"
When working with font dialogs, you may have noticed that Finale sometimes displays different font names than standard OS programs. While standard software usually displays the correct "Full Font Name" according to the true type standard (e.g. "XITS Math" in image 1a), Finale sometimes uses the "PostScript Name" - for example in the Expression Designer dialog ("XITSMath" - i.e. space missing in image 1b). To make it more complex: some Finale dialogs show the correct "Full Font Name" by default, but may also accept the PostScript name when entered manually (e.g. the Font Annotation dialog). Image 2: Left: Some Palatino LT variants show up in Finale with their PostScript name, some with their full font name. Right: In OpenOffice all fonts show up with their full font name. e.g. font annotation files may not be recognized if they use a different name than the selected font name. 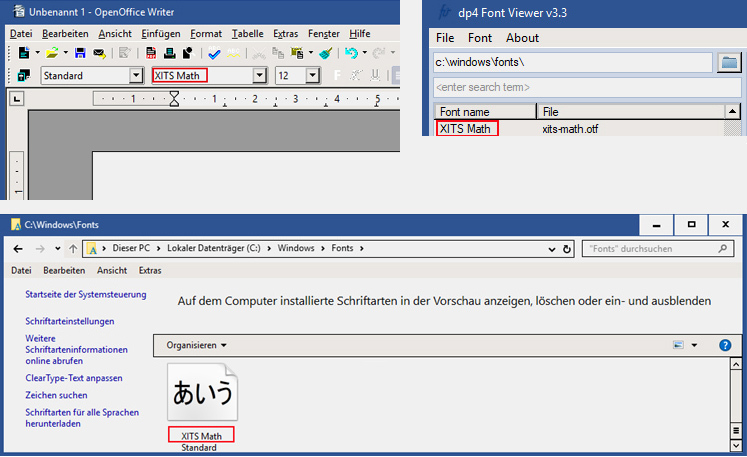 For example if you create a font annotation file for "Palatino LT Pro" (which is the default name in the font annotation dialog) and use the other default name "PalatinoLTPro" in the Expression Designer dialog, you may have alignment problems in Finale (same with XITS Math/XITSMath in the example above). To solve this create a second font annotation (=FAN) file by entering the PostScript name manually into the font annotation font selection dialog and save it into a second FAN file with the PostScript name also as file name. A user on the MakeMusic forum reported in 2015 that he had similar problems when selecting font weights for the "Bulmer MT Std" font. His solution was to use the manually typed PostScript name "BulmerMTStd-Regular" in the font dialog instead. So what is the "Full Font Name" and the "PostScript Name"? The true type (.ttf) or open type (.otf) font file stores several font name types. It even supports different font names for different languages so that the OS can pick the best matching one, although this is hardly ever used. 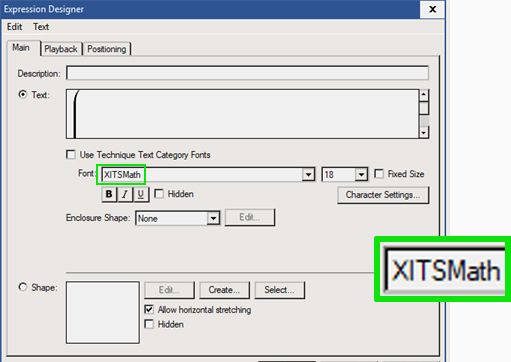 In our example the font name "XITSMath" comes from the "PostScript Name" entry in the font file, while the name "XITS Math" is stored in the "Full Font Name" entry (see image 3). The "PostScript Name" entry mustn't contain spaces by definition of the standard and it can even use a completely different name than the "Full Font Name" (though not recommended...see conclusion below). However this doesn't apply for example to Finale's alternative music font "Maestro Wide". 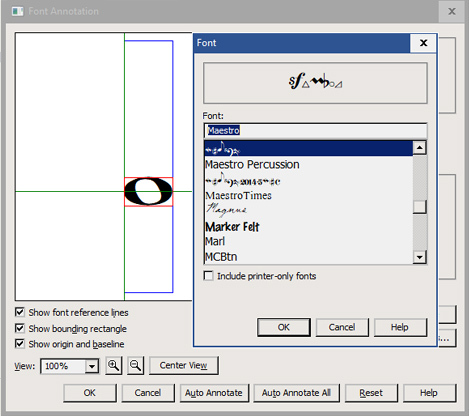 Though it has the PostScript name "MaestroWide" (without space), Finale displays "Maestro Wide" (with space) in the Expression Designer dialog as it assumes that it is part of the "Maestro" font family with a special font weight ("Wide"). it's "Maestro Wide" in the "Maestro Wide" font and "Maestro" in the "Maestro" font. It's a little miracle why Windows decides that these fonts are part of the same font family. It seems that it uses a comparison of the first words of the full font name entry instead of checking for identical family font names. Anyway ... in some dialogs Finale doesn't display sub-fonts of a font family at all. To access "Maestro Wide" in font dialogs where it's not available, simply enter the full name manually and Finale will access it (see animation 6). Don't be bothered that it looks like Finale doesn't recognize the font in the font dialog. After pressing ok it will be detected correctly. This bug was recently confirmed again by MakeMusic. Finale differentiates between the "Font Typeface", i.e. what is encoded in the font file as the font weight (Normal/Regular, Medium, Bold, Semi-Bold, etc. ), and the "Font Style" which can be plain, bold, italic, underlined, strike out and hidden and which usually is applied by buttons or lists in Finale. While the most common typefaces "Bold" and "Italic" are compatible with Finale's internal style handling, problems may arise with other font weights like "Medium" or "Semi-Bold". For example: are they a plain or a bold style? Usually music fonts use the font weight "Normal/Regular" which Finale displays as "Typeface: Standard". But there are a few music fonts that use the intermediate font weight "Medium" which do not map to Finale's internal style "Bold", "Italic" or "Underlined". Instead of handling them as a plain standard font, in the case of "Medium" Finale automatically adds the "Bold" style which makes the font look extra thick (i.e. the "B" button is automatically pressed when the font is selected in the dialog). For example if you call "Documention->Set Default Music Font" and select LilyPond's haydn-26 font with the typeface "Medium" (=Mittel), it becomes "haydn-26 Bold" instead. In dialogs where you can uncheck the "Bold" style manually (as in the Expression Designer dialog above) this is no problem: just uncheck "Bold" afterwards. But in other Finale dialogs (e.g. the Shape Designer or the "Set Default Music Font" dialog) it doesn't make sense to use these fonts as the "Bold" style is always added and can't be removed manually. 1.) Update the font file with a font editor (e.g. FontForge) by setting its font weight to "Normal" instead of "Medium". Don't forget to check if the font license allows editing the font file like this! 2.) Develop a JW Lua plugin for Finale that corrects the style setting for a certain notational element. Probably every Finale user has encountered the old Finale bug that often a collection of musical symbols is shown instead of the font name when searching for a music font in a font dialog. Although Finale has a lot of info about the encoding of the fonts (because of its MacSymbolFonts.txt file), it even displays a worse preview of the font name than standard Windows software (see image 8). One would expect that at least those fonts that are included in MacSymbolFonts.txt would get the correct font name preview. There is unfortunately no workaround at this time to see the correct font name preview in these dialogs, but when you know the font name you can enter it directly into the text field or select the music symbols and Finale will display the corresponding name in the text field above. Image 8: Comparison of Finale and OpenOffice dialog. The Maestro font name is unreadable in the Finale list although it is included in MacSymbolFonts.txt. Some 3rd party font packages that ship with Finale libaries have the problem that the libraries were not updated together with the updates of their accompanying fonts. So if the font name had changed over the years, the libraries were no more compatible with the recent font name (e.g. in the Sigler "Swing package" the font name changed from Swing to SwingMusic). To make the libraries compatible with the correct font name, import them and then use Finale's "Document->Data Check->Font Utilities->Font Replace". There is also the "Change Fonts" plugin for updating staff names, group names, text blocks and lyrics (Plugins->Miscellaneous->Change Fonts). And for quickly updating the chord suffix fonts you can use Chord->Change Chord Suffix Fonts. Though this will not automatically correct the distances between the suffices: for this look at our Chord Style plugin. 5.) Have a look at its "PostScript Name" with a font tool (e.g. dp4 Font Viewer) and use this name instead. 6.) Create two font annotation files: one with the "Full Font Name", one with the "PostScript Name". 2.) Use the identical "Full Font Name" and "PostScript Name"
3.) If there are no sub-fonts, also use the same name as "Font Family Name"
4.) Use the "Normal/Regular" font weight for the "standard font"
5.) If it's the "standard font", don't add "Normal" or "Regular" to the "Full Font Name" or to the file name. Need more music fonts for Finale? The font observations above result from our work on the Music Font Comparison, the House Style plugin and the free Elbsound Music Font Package for Finale. They were tested on Windows 10 only. Fonts on Finale/MacOS may behave different. Finale is a registered trademark of MakeMusic, Inc. The content above was made by Elbsound.studio. Elbsound's plug-ins and fonts were created to work with Finale, but are not affiliated with or supported by MakeMusic, Inc.